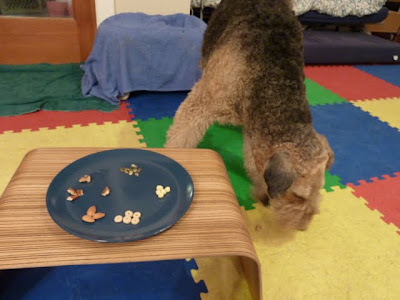 Since I have a 200% accuracy at using my treat machine, mum has been trying to find other healthy alternatives to use instead of the grain-free kibbles that was used in the beginning. She said she didn't want me to eat a bunch of kibbles on top of my normal raw diet. 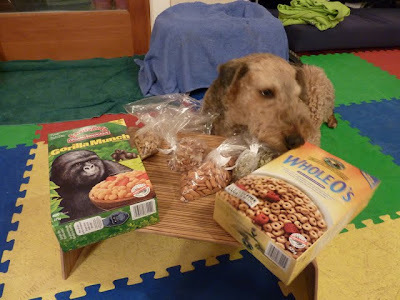 Two boxes of wheat-free/gluten free cereals (I got SuperWHEAT-ALLERGY), and some raw nuts! 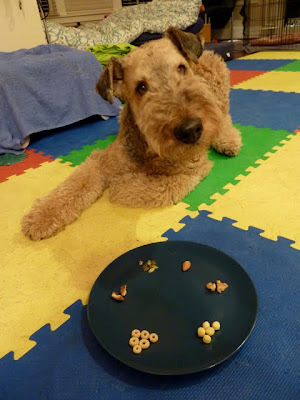 I've never had those cereals before because mum tries to give me food/treats that are low in grains/carbs. Since mum was taking too long being trigger happy (as usual), I decided to find out by my SuperSELF if those new treats were good! But mum said I had to WAIIIIIIIIT! Mum wanted to see if I would eat everything. 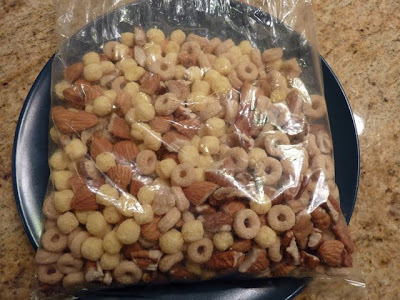 The item list included: almonds, walnuts, pecans, pumpkin seeds, and the two kinds of cereals. Finally, I was set free to EAT! 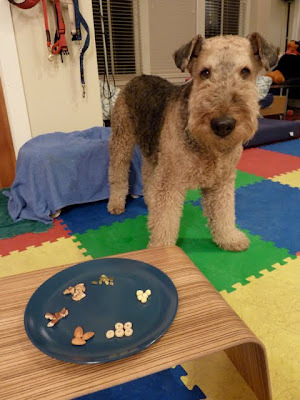 The Verdict: everything can go in the treat machine, EXCEPT pumpkin seeds, thank you! They're so small you can barely taste them, so why eat them right?? 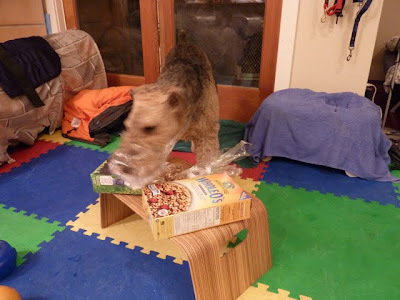 And poured into MY treat machine (with a little bit of the yummy Orijen kibbles)! Now hopefully I can have more than just a couple pulls at a time!! What yummy things your mum put in the treat machine for you, Sunshade! Our mom has been so lax in our training to use ours! Can we please move in with you? Obviously, your mom has it goin' on! 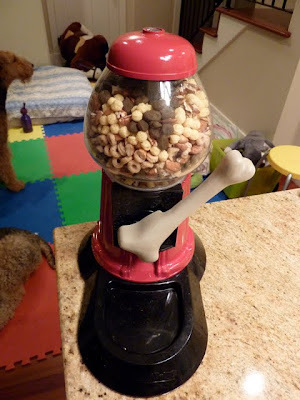 What a yummy mix - does the treat machine get to stay out all day or just a certain times? Jaffa had that treat ball working full speed. 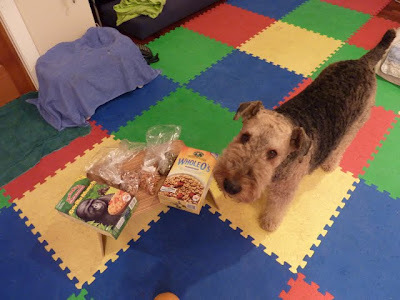 w00fs, that looks sooo yummy...and u is smart to figure out how to git them out...did Jaffa, like it too?? 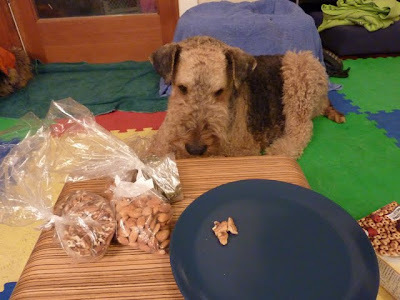 Hmmmm, don't think I would like punkin seeds either, hehehehe. Mama said I can't have one of these treat machines cause I would use it NON-STOP! Plus she thinks Sylvester & Hootie would use it too. They are the little piggies of our 4 cats. 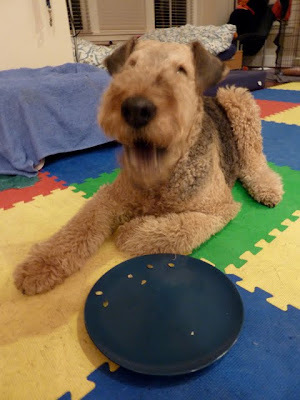 We tried the gluten free corn chex & Mama does not like them. I don't mind them. Mama has had lots of home made foods that are gluten free cause her sis-in-law has the celiac disease. The home baked foods are good. 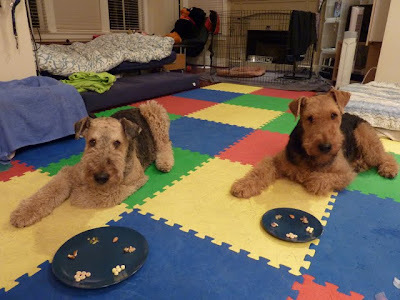 Have fun with your new treats! 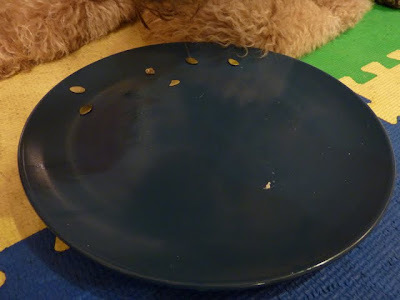 I eat pumpkin seeds! Haaa! Well... I have to admit I eat everything my mom gives to me! All those goodies in your machine sure are yummy! Santo fumo, la mia amica, that is one totally fab treat machine, and the delicious-looking mix your mama filled it with makes it all that much better! 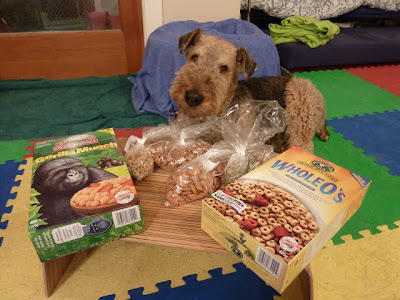 (I, Lucia, love Orijen kibble, too, BTW -- it's a veritable bacchanalia of yum!) 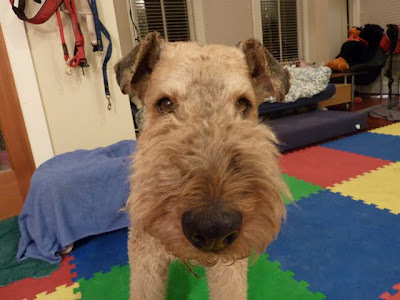 But as impressed as I am with your treat machine, I am even more impressed with your deft handling of the treat machine lever. You, cara amica, are so talented! Tanti baci to you and huggies to Jaffa! oh man that second swipe was like the 3 cherries on the slot machine, JACKPOT! Stinky looked pretty content with his snack ball too. 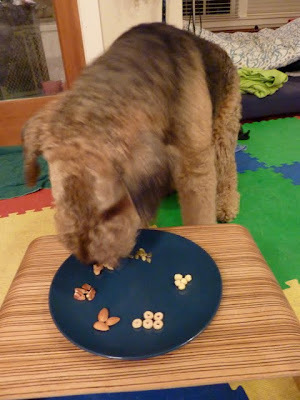 That was very clever of your mommy to test the treats first. We're thinkin' we would probably eat everything. That treat machine is very nice. Wish we had one.